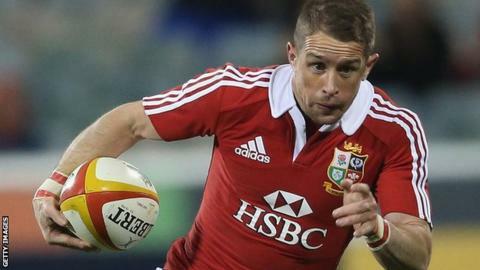 Shane Williams scored a total of 60 tries in Test matches - 58 for Wales and two for the British and Irish Lions. Australia's decision to select foreign-based players could prompt England to do the same, says former Wales wing Shane Williams. The Wallabies' change means New Zealand and England are the only major nations whose rules ensure only home-based players can play Test rugby. "When you look at England, they don't have many players playing outside England," said Williams. "You look at [England international open-side] Steffon Armitage and he has been playing exceptionally well for Toulon. Steffon Armitage and Leigh Halfpenny are Toulon team-mates, but the Englishman is not selected to play in Tests while Halfpenny is an automatic choice for Wales. "I'm sure they [England] would love to have him in their ranks." However, Wasps director of rugby Dai Young has said England should stick to their stance, and Welsh rugby had been damaged by not having a similar policy. Australia's change in selection policy means they could pick Armitage's Toulon team-mates Matt Giteau and Drew Mitchell against Wales and England at the World Cup. The move comes as the Australian Rugby Union, which is struggling financially, sees several players heading abroad after this year's tournament. Wallabies coach Michael Cheika is now able to select anyone who has at least 60 caps and played for seven years in Super Rugby with an Australian team. "It's bad timing [for Wales and England]. There are a lot of quality players playing outside Australia - the likes of Matt Giteau, Adam Ashley-Cooper," Williams told BBC Wales Sport. "They are quality players I would prefer not to see on the team sheet if I'm honest. It certainly does strengthen the Australian squad. "Having played against them, certainly Matt Giteau on his day is one of the best players in the world."